FILE - Angolan Jonas Savimbi holds a joint statement at the media conference in Umtata in the Eastern Cape, Jan. 8, 1997. Angola's government has said it will soon exhume and give a "dignified burial" to Jonas Savimbi, a national icon killed at the end of the nation's lengthy and brutal civil war. The rebel turned opposition leader was buried in a rural area in 2002, without the honors that many Angolans felt he deserved after a lifetime of resistance, first against Portuguese colonial repression and later against the nation's socialist government. Even the government's harshest critics — among them, human rights activist and journalist Rafael Marques de Morais — say this is a welcome step by President Joao Lourenco, who took office just over a year ago. "I'm not cynical about this," Marques tells VOA. "It's really important that it be done." Savimbi is regarded by many Angolans as a liberation hero for leading the fight against Portugal for independence, which came in 1975. He then founded the UNITA party and led a bruising 26-year civil war against the socialist government, which has been led since independence by the ruling People's Movement for the Liberation of Angola. 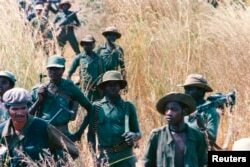 FILE - UNITA troops walk through a field, 20 miles from the front line, at Munhango, Angola, April 29, 1986. The UNITA forces, led by Jonas Savimbi, were engaged in a guerilla war against the Angola government. Savimbi nearly won a presidential election in 1992, but some analysts say his refusal to accept the results prolonged the war. He was killed in 2002, at the age of 67, in a battle with government troops. His body was quickly buried nearby. Alex Vines, head of the Africa Program for think tank Chatham House, says Savimbi was a fascinating man — and he can see why former President Jose Eduardo Dos Santos wanted him to sink into obscurity. Dos Santos ruled for nearly four decades before stepping down last year. "I met him several times," Vines said of Savimbi. "He was extremely charismatic, rather authoritarian. People around him were very afraid and very obsequious with him. But you did feel the charisma. It is like a number of figures that I have met over my career who have been very controversial, involved in human rights abuses, but yet they were tremendously charismatic." Savimbi, too, was accused of human rights abuses during the lengthy war that ended in 2002 with his death. The conflict saw the deaths of more than half a million Angolans and shattered the nation's infrastructure. 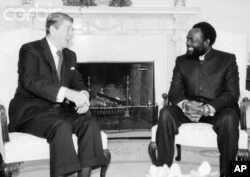 FILE - Jonas Savimbi, right, meets with U.S. President Ronald Reagan at the White House in 1985. Marques says a proper burial for Savimbi might help close the division between the ruling party and the opposition in Angola. Such divisions are common across Africa, he says. "And, so, there is never a sit-down between brothers and sisters to build a country together," he told VOA. "And it's always the ruling party thinking everyone is the enemy, and those in the opposition thinking the ruling party is the enemy, and that's what plagues most of the political systems in Africa, when parties think of themselves as the state." Vines agreed that lack of reconciliation is an issue that plagues many African nations, and that the proper treatment of major figures matters. In Mozambique, he said, the government's decision to give burial honors to longtime rebel leader Afonso Dhlakama, who died earlier this year, was an important gesture. "There is some echo, I think, in Mozambique with what's happened in Angola," Vines said. "And maybe, just maybe, that what has happened in Mozambique helped focus further President Lourenco and some of his advisers' attentions that it was time to do something similar in terms of reconciliation, of the body of Jonas Savimbi." But Marques says this move is about more than one man. If anything, he says, Savimbi's reburial could open the door for countless others. "It's important to acknowledge that many tens of thousands of Angolans perished in this war, and it's important that the government goes beyond returning the body of Savimbi, so that a process of issuing death certificates to the soldiers on the government side and the UNITA side, who died in the war, that the people who died in the war are properly accounted for," he said.